February’s competition held during the JamBEERee meeting is in the books. The competition was for categories 6 and 7 (Light and Amber Hybrids) from the 2008 BJCP Guidelines. Many thanks to Andy Anderson, Colleen Cannon, Mike Reinitz and Bill Ridgely for their hard work in judging the competition. There were eleven entries total with strong representation from BURP and the DC Home Brewers. The breakdown was as follows- from category 6: 2 cream ales, 1 American blonde, 1 kolsch, and 1 American wheat; from category 7: 3 northern German Altbiers, 2 California commons, and 1 Dusseldorf altbier. 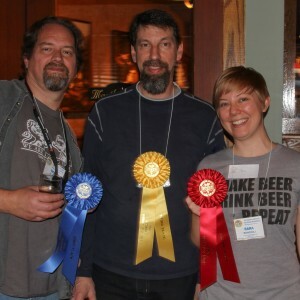 The judges had a hard time deciding the winners, but Bob Rouse representing BURP and the DC Home Brewers took first place with his “Steam McQueen” California common, while Erich Streckfuss and Sara Bondioli also representing both clubs took second place with their “Beer-flavored Beer” cream ale, and BURP’s own Greg Leifer took third with his “Im Fuchschen” Dusseldorf altbier. In addition to ribbons, all the winners took home gift cards graciously provided Derek Terrell from My Local HomeBrew Shop. For BURPers who entered the competition and didn’t pick up their score sheets but still want them, find Greg or Dave at next month’s meeting. If you’re interested in Bob’s award-winning Cali Common recipe, check it out below.